In case you didn’t know, my birthday was on Monday, and our anniversary was the day before that. Needless to say it’s been a food-filled week! With my brother having the same birthday as me, it’s always felt like Christmas in July, but now with an anniversary to add to the festivities, July is quickly becoming my favorite month of the year. 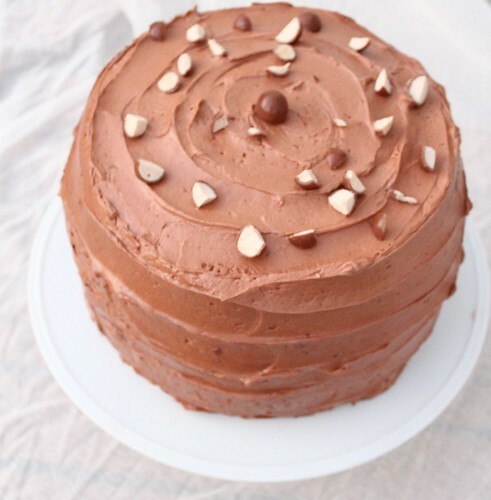 Unfortunately, (or fortunately for him), brother John is spending the summer fishing working in Alaska, so I might just have an excuse to make another celebratory birthday cake when he returns in August. I know some people would view it as work to make their own birthday cake, but I view it as an excuse to buy fancy ingredients and make something over-the-top without any regrets. It’s basically like my present to myself. I had a lot of fun sifting through recipes, but with so many combinations of cake and icing to chose from, it was really hard for me to decide on one. I ended up picking this cake because Sweetapolita named it “Campfire Delight” and since I love summer and the campfires that come with it, I couldn’t resist. After making this, I don’t think campfire delight is really a fitting name (after all it’s missing the essential graham cracker part of the s’more), however this cake is totally over the top delicious. I was set on the fact that I wanted to make a 6-layer cake, only because I had never made one before and I wanted to try something new. Unfortunately I didn’t want to be taking pictures while visiting with friends, so I have no pictures to show you of the inside of this mile-high cake. You’ll just have to trust me: 6 layers really makes a nice presentation and is definitely worth the extra effort. How can you go wrong with an almost equal filling to cake ratio? Keeping that in mind, you can’t eat very much of this cake (at least at one time). But that makes it a perfect birthday cake to share with some friends! *I used Williams-Sonoma’s Dutch cocoa powder, but I think this is a better deal. 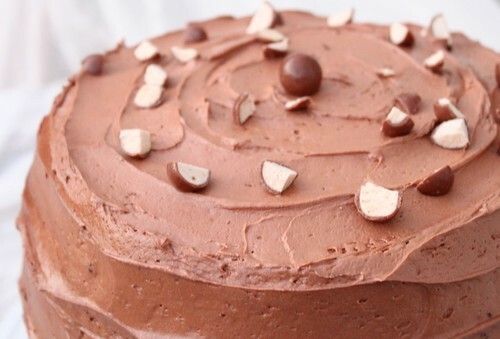 A good quality cocoa powder really makes this cake. 1) Prepare 3 x 9″ pans by cutting out a circle of parchment to line the bottom, and butter and flour to coat the edges. Preheat oven to 350°. 2) Sift all dry ingredients together in the bowl of a stand mixer. With the paddle attachement, add the remaining ingredients to the dry ingredients and mix for 2 minutes on medium-low. (You may need a splatter guard on your mixer as batter will be liquidy). 3) Pour into prepared pans. To ensure even layers, I weighed the pans until I get the same amount in each. 4) Bake for 20 minutes, then rotate placement of pans in oven. Bake for an additional 15 minutes (35 minutes total) or until a toothpick comes out clean when placed in the center. Cool on wire racks for 20 minutes, then remove from pans and let cool completely. Wrap in plastic wrap and place in the refrigerator until you are ready to assemble. 5) To cut the cake layers to get a 6 layer cake, start with cold cake. 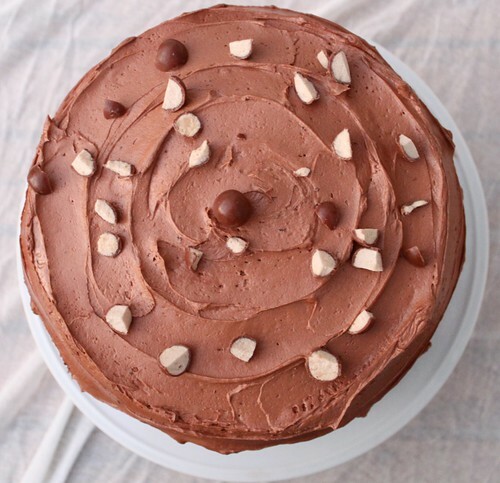 Using a knife, score a line around the outside of the cake as to where you want to cut. With a serrated knife cut along the line, turning the cake as you go until all cuts reach the middle of the cake. Frost as desired. Place the marshmallows in a pan with a silicone baking mat or parchment paper. Place on the bottom rack of the oven and broil until brown. Make sure to watch them continuously as they go from brown to burnt very quickly. In a mixer fitted with the paddle attachment, mix butter and powdered sugar on low for about 1 minute. Add vanilla and mix on high for 3 minutes. Finally add marshmallow cream and powdered sugar and blend until just mixed through (about 1 minute). Spread evenly onto cooled layers. Clean out the bowl and paddle used for toasted marshmallow frosting, and beat the powdered sugar and butter on low for about 1 minute. Add vanilla and ovaltine malt powder and beat on low to combine. Add the melted chocolate and beat on medium speed until smooth. Add whipping cream and beat on med-high for another minute. Use right away. *Do not try to substitute half and half or any other milk- You will end up with a runny frosting (speaking from previous experiences). All 3 recipes slightly adapted from Sweetapolita. This entry was posted on July 31, 2011 by Spice Is Nice. It was filed under Cake, Dessert .